We occasionally get asked by people outside the US and Canada whether we ship to other countries. We don’t presently. Every country has unique shipping requirements and takes some effort to support; sales to that country have to be worth that effort. 1. 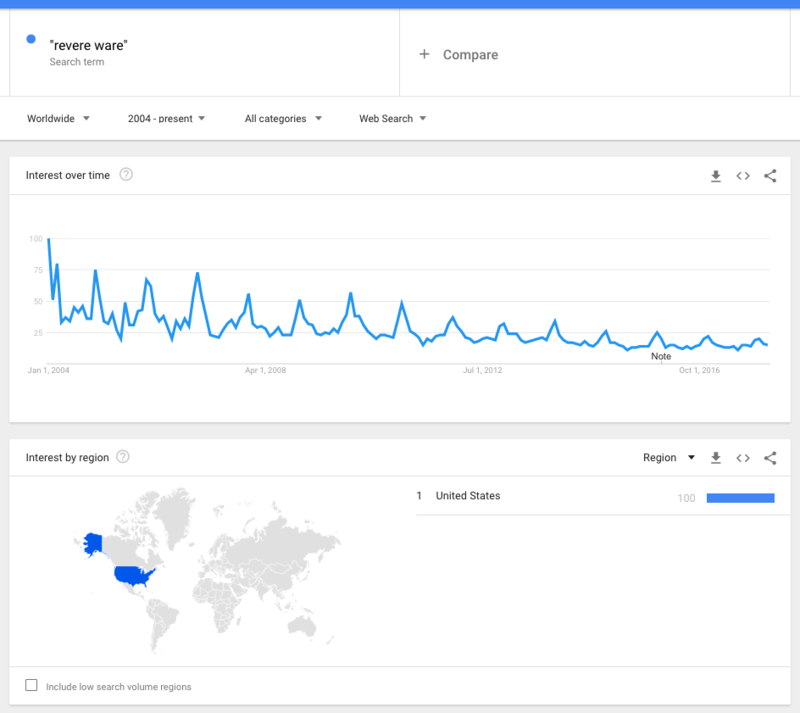 Interest in Revere Ware is declining over time. In the last 14 years, interest has dropped by about 3/4. 2. Interest is entirely limited to the United States. For us, this means that, there almost certainly isn’t enough demand in other countries to justify the effort to support shipping there. We do support Canada, which we only sell the occasional part to, but that work is already behind us. Lastly, it is interesting to see that Google searches mirror what we see ourselves in interest in our products; a yearly cycle of interest that peaks around the holidays and is lowest around mid-summer. This must have something to with replacement parts for Revere Ware being the perfect holiday gift for that hard to shop for parent or grand-parent.